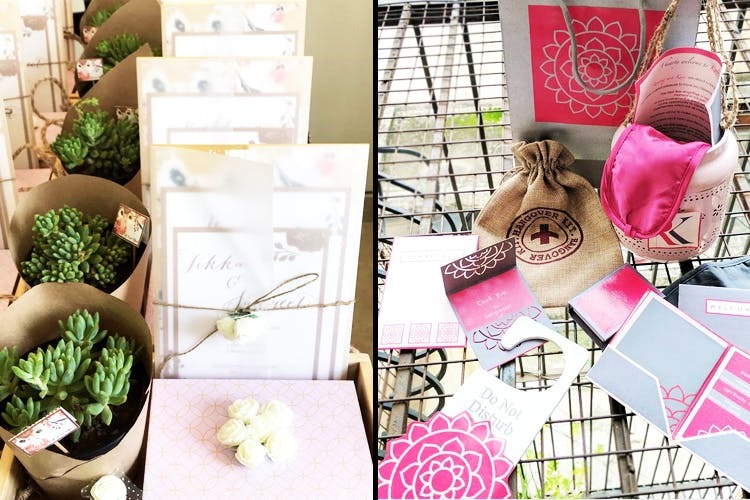 Vintage Notes Papery is a brand that offers customised stationery and gifting items for weddings, bachelorettes and really, any kind of occasion. From personalised diaries and storage containers to customised baskets with cookies and candles, everything they create looks like it's right out of Pinterest. Started in 2016 by Ritu and Farah, Vintage Notes Papery is a start-up that offers items meant to be treasured and hoarded like a keepsake. If you have a look at their Instagram account or their Facebook page (through which they take all their orders), you’ll notice that the kind of items they offer is not just limited to wedding invites and party boxes, but they even sell home decor and utility items like platters, lamps and succulents. We particularly love VNP for their extensive use of materials like jute, lace and agate. The best part— they’ll customise everything just the way you like it and according to specific occasions. So, for bridesmaids’ boxes, they can curate baskets filled with delicious lip balms, creams and sanitiser along with other components you like. Scented candles, almond rock candies, luggage tags and small planters are just some other items that Vintage Notes Papery uses to create boxes that will make anyone feel oh-so special. VNP has also made bottle invites with messages and sea-shells inside for a beach-themed wedding, so if you communicate your requirements well, you’ll be impressed by how creative these guys can get. A physical store to actually get the touch and feel of products would've been perfect. They also do personalised stationery like envelopes, diaries, calendar and more. However, we recommend that you get in touch with the peeps at Vintage Notes Papery for orders above 20 pieces. They deliver across India, and are more than happy to help you out with suggestions. Price: Starting at INR 200 per piece; rates may vary for bulk orders.